The G7 summit, scheduled for June 8-9 in La Malbaie, Canada, is going to be held on a six-vs-one basis, with everyone double charging the US because of its trade tariffs. Tensions between the G7 states, the summit’s agenda and the possible split of the Western alliance – these are the topics addressed by Valdai Club experts Radhika Desai and William Wohlforth in an interview with valdaiclub.com. According to Desai, the level of tension between the member countries is so high that one could almost smell it in the air. “I think this is certainly the feeling across the media, and these relations have been ill since the last American elections,” the expert said. “The previous summit in Italy was also tense, but it was on the issue of climate change. This year, the issue is something that separates them even more strongly – the tariffs announced by the American administration. So on this matter there is an outrage, particularly in Canada. The prime minister and the foreign minister refused to do what the American administration wants them to do. They are now making strong statements – not only against the tariffs, but against the way they were announced, seemingly implying that Canada poses a security risk to the US”. “I would add that many people will see it as a result of Trump governance, and he have certainly brought his own, very unique, style to this. However, I think there is another underline problem. One has to ask himself, why was Trump elected in the first place? He was elected, because the American government can no longer be the way it used to be, they had to address economic problems of which the US suffers. In part the reason why Trump got the votes was that he claimed that he would address them”. Six G7 member countries have already issued a joint statement, expressing discontent with the US politics. “It will obviously be a six against one,” says Desai. “It will be a double-charge six against one, because basically the American tariffs are actually hurting a lot of countries. Normally countries like Canada are been regarded as loyal allies of the Americans, but now they are going to protest it along with the Europeans, who are now very vulnerable”. 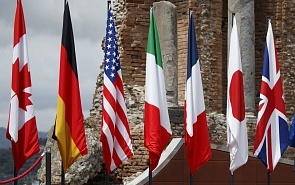 William Wohlforth generally shares her point of view, pointing that disagreements in G7 were observed earlier – and once again because of discontent with the US policy: “I am not sure tensions are higher now than in the lead-up to Iraq War in 2002-2003. However, there is no doubt that the Trump administration is isolated on trade, the environment and Iran. There will be some issues – such as a planned statement on coordination on the “defense of democracies”, where there will be a show of unity. But everyone knows that to greater or lesser degree all the allies are angry at the US president and are in damage-limitation mode, weathering the storm in expectation of the US slowly rejoining the consensus on key issues in the years ahead”. President Trump’s announcement that he would impose tariffs of 25 percent on steel and 10 percent on aluminum creates the danger of a global trade war. Other countries can impose retaliatory tariffs under the rules of the World Trade Organization. Radhika Desai emphasizes that some examples of the US eventually joining the consensus could be seen before: “Obviously, trade will attract the most attention. There are many divides emerging. In my humble opinion, the US never was hegemonic. Even in the 50s and 60s, in the Cold War context, there were many differences between the Europeans, the Americans and the Japanese. When Europe launched its ‘Ostpolitik’ strategy, the Americans had to fall in line with the others. American power has historically been highly exaggerated, but even then, in comparison with the power it had in the 50s and 60s, it is declining. It means that alliances that constituted the G7 in the first place, are less sure now. For example the Europeans have already taken a different line vis-à-vis Russia, being dependent on Russian energy”. Unlike Wohlforth, Radhika Desai believes that at this time the contradictions within G7 are more structural than situational, being a natural symptom that the coalition will collapse soon: “G7 itself has kind of lost its meaning, because when G7 was founded, it was supposed to be an organization of the seven leading economies of the world. And today, if you look at the seven leading economies, China and India should be in it, but they are not, but Italy and Canada are. G7 has lost its meaning due to the tectonic shift that is taking place in the world order. Basically, China is attracting a lot of business space – New Zealand and Australia are getting close to it, because the Chinese economy became such a magnet one cannot ignore”.